it has been a rough few weeks and the negative inner-talk has been going strong. you know how it is when you try to stop thinking about something and it goes around and around and around like a hamster in a wheel? so i have been thinking of doing some consciously "positive" art. we'll see what comes of that. 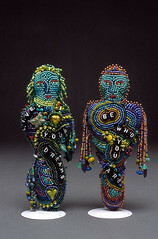 but meanwhile, these are 2 beaded art dolls i made a number of years ago -- in an attempt to pull myself out of a dark time and i do think it helped. "live your dreams" and "be who you are" are each 6" tall. seed beads on ultrasuede. what a week, maybe i will find some energy to post about it later. at least i had the energy to finish these 2 little guys that i started on monday. and they are on etsy. The little hedgehog is a lot less grumpy than the hedgehog I had as a pet. Though my hedgehog igle did once try to eat a teabag, or at least attack it within an inch of its life. It smelled threatening, I guess. 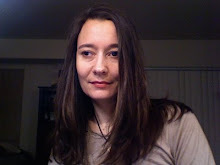 it has been a rough few weeks and i have not felt much like blogging. but i do want to show you my kimono, which i finished. 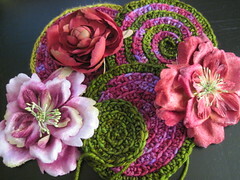 the pattern is by Jane Thornley, but it's more of a recipe, a lot of it is improv. i used mostly silk and merino, mostly by string theory and alchemy and curious creek. i love the color combinations. it looks crooked here but that's just how i have my shoulder cocked, charmingly i am sure. i found the skirt i am wearing in this photo the day after i finished the kimono, and an import shop so I thought I should buy it. (The store is called Istanbul Imports, but I think they import from various parts of the Middle East and Central Asia.) I loved the Kimono so much that I cast on another in autumn colors. I have some watercolor to show you in the next few days, too. Life has been stressful. We had a flood at work 3 weeks ago. We spent a couple weeks deconstructing damaged areas and this week just started the 1st baby steps of reconstructing. I hurt my back sometime during the crazy moving out process. possibly by sometime next week I will be able to move back to my desk. I've been sharing a former closet with 4 other people and it's been hectic. Thank goodness for my iPhone, since I have not had a phone and for a couple days had limited access to a computer. I am not one of those people who thrives under pressure. here is something i am working on. pitt pens and prismacolors. only problem is that the super smooth paper i use for pen and ink is not the best for colored pencil, but i will see what i can do. also the woman does not look very happy but i was not really in the best mood i guess when i started drawing her. still, if you can't be honest in your art, where CAN you be honest? 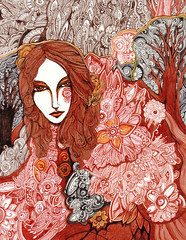 this is a pen and ink drawing I did for my friend Kathy. I am not really sure if it has a title. Maybe Kathy knows? Anyway, I was very happy with how it turned out! I have been working on it off and on over the last couple weeks. we went out last night to the Capital Club, which is a restaurant / bar with Moroccan decor. So that was fun. And there was belly dancing, Troupe Hipnotica. We were a little dissapointed by the short sets but all in all it was a good time! I'd like to go back sometime. here are some more colors playing together. this time my most beloved autumn colors. 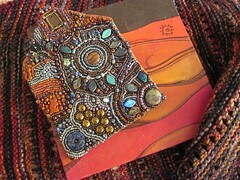 the beaded house features some special beads: tigers eye, lapis, and jasper. the yarn is from handmaiden, red fox is the name of the colorway, and that suits it perfectly. the painting is one i did a few years ago, one of the early paintings in the strata series, of Diatomaceous earth. Even those these art works were created over a number of years, you can see the same color scheme has been motivating me for quite some time! and i am sure i will create some beauties this autumn as well. still playing with letting my art mingle. and with green and purple in this case. these 2 pieces were created about 12 months apart - but you wouldn't think so! i may actually use this button as a closure on this piece. this is a project i am working on. it's not working quite like i had in mind, which just means i have to do some more tinkering. but i do love these colors together. the olive green yarn is string theory and the magenta yarn is malabrigo. the silk flowers are from joggles. i just wanted to show this to you as some more examples of how one can use contrasting colors together without them looking cartoonish! here is some more of my art, playing together. 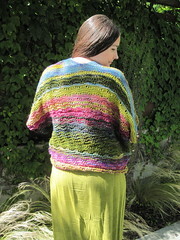 the knitting is a freeform project, the basic pattern called the Medici Vest by Jane Thornley. 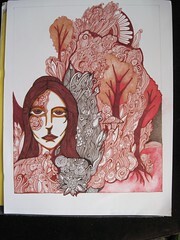 The drawing is one of my pen and ink drawings, using Pitt artists pens. 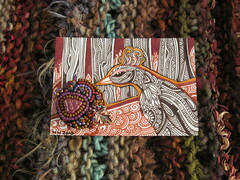 The beadwork is a little beaded button I made, from a class I occasionally teach. 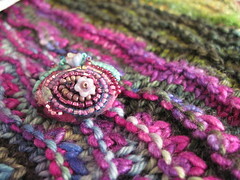 Robin Atkins showed me how to do bead embroidery around a button form. i can feel summer winding down, and autumn just showing a flick of her skirt now and then. the sun is just starting to get low on the horizon now and the air smells faintly of the sea and like bonfires out at Golden Gardens park, but that makes me think of autumn. And I do love autumn colors. i sometimes like to play with mixing my art together. i somehow see how it is all connected, though i am not sure how it shows up to other people. 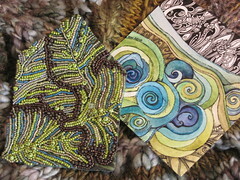 this is a shawl called frond that i knit this summer, a beaded house i did 2 or 3 years ago, and a watercolor / pen and ink drawing i finished recently. my beloved fuji with the awesome macro lens is just plain wearing out - it must be close to 8 years old? so this i photo is from a canon powershot, but it's just not the same. we'll see when a new camera is in the budget. in the meantime i'll just do my best to capture the world around me!